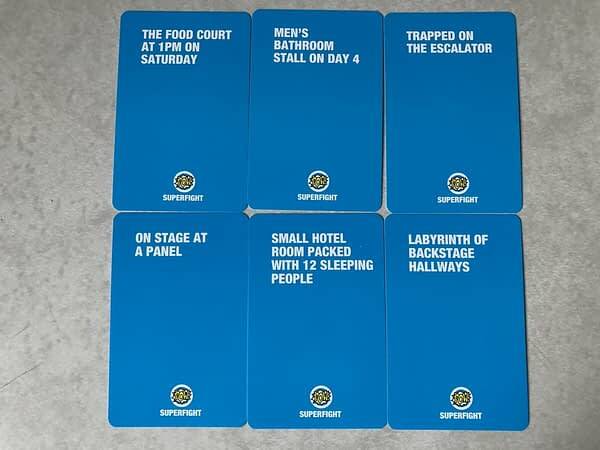 Usually, at almost every game convention we attend, we meet up with Skybound Games to see what new stuff they got for Superfight and Red Flags, along with their newer titles on the way. Back at PAX West we were pleased to see them again and picked up the two new Con decks for each game. We threw them in the mix and gave it a shot to see how well they play. 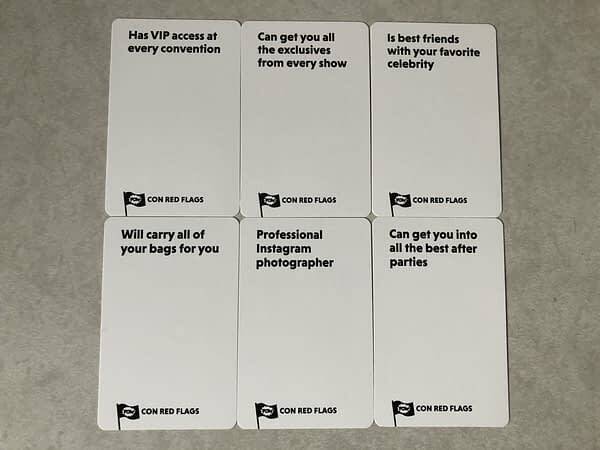 We’ll start with the Red Flags set, which of the two I found to be the funniest. Red Flags, if you haven’t played it before, has you and your friends trying to hook each other up with awesome dates. You lay down two good qualities, and then the person to the left lays down a red flag quality you have to spin your way around. The convention set definitely adds a new flavor to the mix as you’re now being given options that geeky con-goers would love. Like carrying all your bags for you and being best friends with your favorite celebrity. But the downsides are both amazing and painful reminders of some bad times some of us have had at conventions. Only dating you for your hotel room is a definite no-no, along with being someone who hates every fandom you love. This deck opens up possibilities for you to explore as you’re sitting in line for the line to the line for the line to get into the line to get in. They are amazing options that any seasoned attendee will get a chuckle out of. 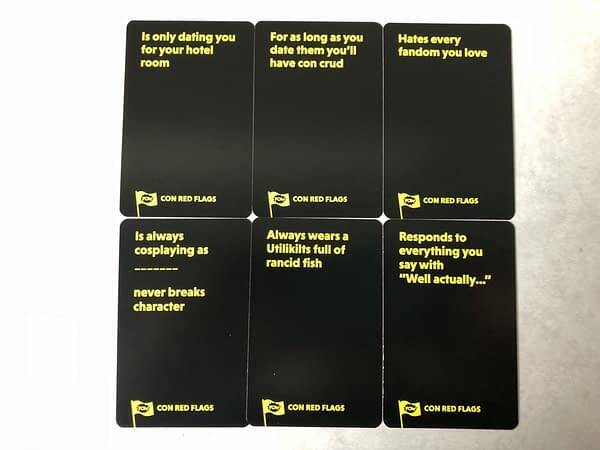 This deck is a winner for us and a must-have if you attend cons on the regular. 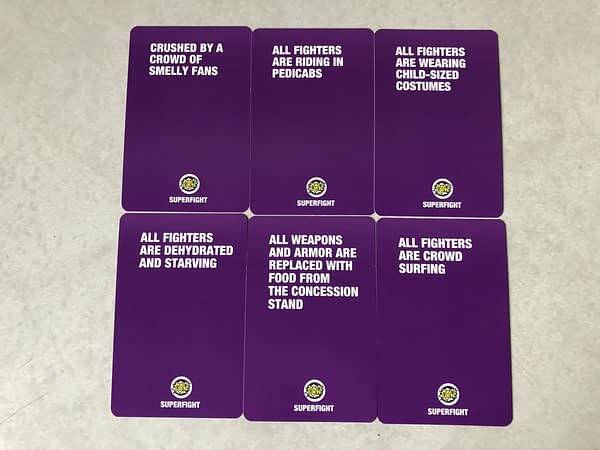 The Superfight deck wasn’t as funny, but the options are plentiful when mixed into other decks. 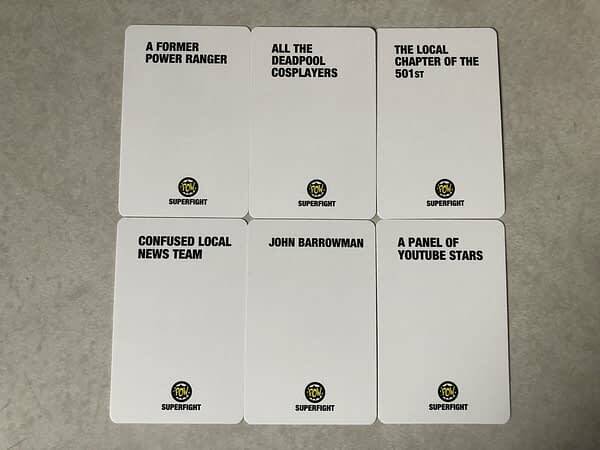 Superfight has you pick a character, and a coupel of attributes to do battle with the winner being chosen by the other players. This deck isn’t a straight shot of any one item in particular. You’re getting characters, attributes, locations, and hazards. The characters are actually pretty dope compared to some other sets, where you get people such as a former Power Ranger, John Barrowman, or the Local Chapter of the 501st (which is a regiment of Storm Troopers for the uninitiated). The attributes are interesting but are kind of lacking in some ways. They seem to be more here for humor and to hurt you more than anything where in other sets they proved to be helpful. I get that “still wearing their day one underwear” could be used as a tactic for the win, but it feels more like a disgusting hinderance that would sway the vote away from you more than it would be thought of as an item of victory. The locations are spot on and I have zero complaints about them, because I believe we’ve all experienced most of them at one time or another. Such as being trapped on the escalator, or in the food court at 1pm on a Saturday. These are key locations that you can use to your advantage to give yourself a proper boost of influence. Creative minds will be able to draw from their strengths in these places. Lastly, the hazards are just here for pure fun. Having all of the fighters dehydrated and starving is amazing enough to get some laughs on its own. Or having them wear child-sized costumes and having them describe which ones they picked out and why is a priceless item that keeps on giving. I enjoyed these hazards compared to previous sets. 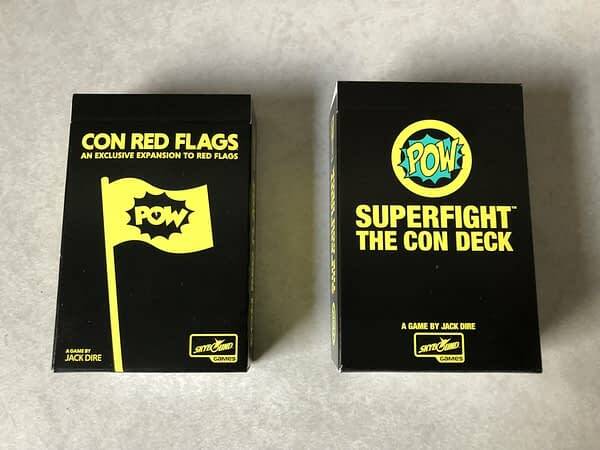 Overall, I enjoyed mixing both of these sets into my already vast collection of Red Flags and Superfight decks. It makes me want to bring them to the next convention and play some people randomly to get some laughs. 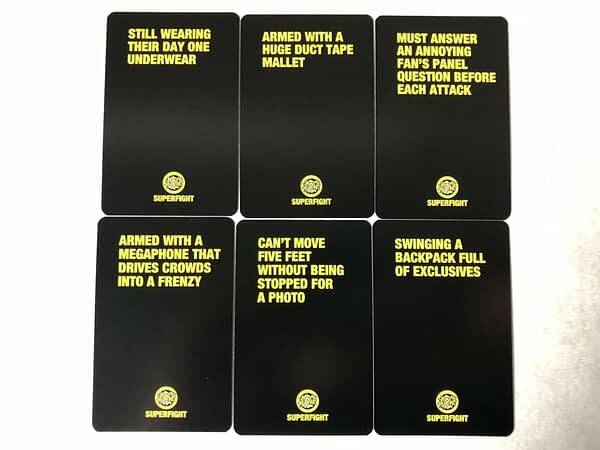 If you own either game, they make great additions, but we lean more on the Red Flags set for humor purposes.